Polka Dot Overload | Sewing, knitting & vintage projects, tips, tutorials and cartoons! : My First (Successful) Dress! My second post for this blog was an illustrated chronicle of my humble sewing origins. My mother even dug up my first skirt (circa 1985) for the occasion. In the post I mentioned my first successful, fitted dress project--an ankle-length spaghetti-strapped dress in floral rayon challis. I finally found a photo of it last night (while working on clearing out the soon-to-be nursery) in a photo album from my winter 2001 trip to Cambridge, England. It's fully lined--I think it was the first lined item I ever made--and there was quite a bit of handstitching going on in the bodice as well. I got lots of compliments on it and wore it to every nice event I could until it no longer fit me! I wish I could remember the exact pattern--I'm fairly certain it was a Butterick, and that the pattern photo showed an example in border print. I even spotted it on a blog post recently as an example of someone's pattern destashing, but can't remember which blog. I'm sure it's long out of print. And that is the story of my first dress! Do you still remember your first successful project? What was it? P.S. In case you're wondering why I'm up at 6:15, I have Cartoonist Baby and her charming high kicks to thank! Your first dress is very cute! My first project was a pair of pyjamas for my then 3 year old. I was very proud of them (what with the eased sleeves, buttonholes, etc) until he tried them on. "But where's the pockets, mum?" he asked. I realised I had much to learn (... including not to sew for 3 year olds who had opinions about designs!). I'm on my first project right now! A no-brainer: A-line summer skirt. Unfortunately, with a toddler at home, and the fact that I don't actually own a sewing machine, the pace of my sewing is glacially-slow. Also just wanted to say that it's nice to see someone else who uses cartoon images of herself for her online persona...! I love your dress! 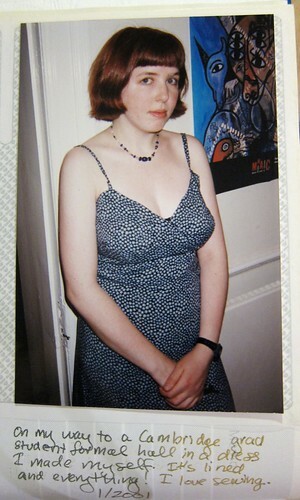 My first successful dress was also polka dot, finished in time to go swing dancing in 1998. My first successful finished PROJECT, though? This pair of spaceship pajamas, also in '98. Super-cute. This weird thing happened, though-- everyone in my dorm started BORROWING them. Male, female, all sizes. It became a THING TO DO. There were signups. Naturally, those PJs did not last a year under that hard wear, but it was pretty cool to have such a success so early on! Emma Louise, there's nothing wrong with slow, especially when starting out. I'm still pretty slow most of the time--take your time and enjoy it! I love your maternity wardrobe you have been working on. I have only made one maternity dress for myself years ago. I still have it in my closet- can't bear to part with it even though I will never wear it again!